Welcome to the Faithful Four! Over the past few weeks we have whittled down the field from 32 saintly souls to a holy four: Martha of Bethany, Gobnait, Zenaida, and Pandita Ramabai. The spiritual nets have been cut down and one of these four will, in a few short days, be awarded the coveted 2019 Golden Halo. This marks the first time in Lent Madness history that we have an all-female Faithful Four. This means that at the end of this 10th year of Lent Madness, we will have crowned five male winners and five female winners. Today it’s Martha of Bethany vs. Gobnait. To make it this deep into our little tournament, Martha got past Mary of Bethany, Nicodemus, and Photini, while Gobnait defeated Hrotsvitha, Paula of Rome, and Ignatius of Loyola. Tomorrow Zenaida will tangle with Pandita Ramabai and then our respective Faithful Four winners will vie for the 2019 Golden Halo on Spy Wednesday, with the winner being crowned at 8:00 am on Maundy Thursday. Ever since I began to discern my call to the priesthood and through my priestly formation in seminary, I have wrestled with my active nature, attempting to become more contemplative. I imposed disciplines upon myself and tried many forms of prayer and meditation. Although many principles of contemplative prayer and mindfulness seeped into my way of being, the stillness and quiet never took, and I saw this as a failure. Finally, thanks to my spiritual director, I accepted God has called me to be a Martha, busy with the work of love and service. I should stop painfully trying to become something I wasn’t called to be. Just as the medieval hagiographies saw in Martha an ultimate reconciliation of action and contemplation through her ministry of hospitality, so can all of us Marthas celebrate rather than resist our spiritual gifts. As her medieval biographer, Psuedo Marsalia wrote, “Martha chose to perform her own ministry and it pleased God greatly.” We do not choose the calling God gives us. Sometimes we or others don’t understand, or we are tempted, like Jonah, to run away. Perhaps it was Martha’s courage to follow her own true vocation to action and service that allowed her to perform miracles similar to Jesus—water to wine and resurrecting a child. Perhaps it made her a figure with the strength to tame dragons, honored to this day as Santa Marta Dominadora, the dominator, helper of the oppressed, the most Christlike calling. Regardless of whether we are inclined to action or contemplation by our temperament and vocation, the hectic pace of modern life demands all of us be doers. We must all look to Martha’s example for guidance. Grounded in love for Jesus, we can serve and lift up others. Since Martha’s lifetime, many have followed in her footsteps as busy worker bees building up the kingdom of God. But Martha was the first, our Biblical example of a holy, active life, and for this reason, she deserves the Golden Halo. There are those who are quickly recognized for their life and work. Some who stand out in the church because of their positions: priest, bishops, and deacons. Others whose work is so public that we can’t help but notice them: public martyrs, activists, and those in the news. And still others whose works are enshrined in the literature of our faith: those recorded in Scripture, in the great works of church history, and in the annals of reform and renewal. Yet the bedrock of the church are those who toil daily in the faithful work of discipleship. Women and men whose names are often forgotten – those who are overlooked by history. It is among these quiet, daily disciples that we discover Saint Gobnait. One of Gobnait’s patronages is iron-workers. When excavating the site of Gobnait’s home in 1952, they discovered the remains of 137 iron forges. Can you imagine the number of workers required to sustain such a site? There must have been – covered in soot and ash, in the midst of the hea t, creating goods and artwork that would be used and enjoyed by those with wealth – a whole host of laborers and their families living out their days without recognition. It is among them that Gobnait walked. It is to them that she offered her healing ministry – employing prayer and salves made from the honey of her beloved bees. It is on their behalf that she offered prayers. And it is for them that she repeatedly defended this community. She defended her community. She offered healing. She founded a monastic community. She cared for the creation. And yet history would have us overlook Gobnait. Her life is not known because she shows up in the historical record of the day, or because an early historian recorded her life. Instead, we know of Gobnait from two sources. She is a part of the Life recorded about her brother Saint Abban. And she is remembered through the stories preserved by the ordinary people in her community and passed down through the ages. Perhaps at this present moment in the life of the church, we need less “superstars” and more ordinary saints. Faithful people struggling with what it means to be disciples in the grind of daily life. Unnamed folks far from the spotlight performing extraordinary acts of love, kindness, and service on behalf of those who need it most. PLEASE NOTE: At about 9:52 p.m. EDT, the SEC confirmed some voting patterns that we had been monitoring since the afternoon. There were a number of repeat votes for Gobnait, cast by people who were not respecting the one vote per person rule. As a result, we have blocked several addresses and have removed 150 votes from Gobnait to compensate for that number of inappropriate votes. This is your reminder not to vote more than once per contest. FURTHER NOTE: Multiple additional addresses have been blocked around 11:18 p.m. EDT. Please enjoy your play, but vote ONCE. Keep Lent Madness fair and fun for everyone. 138 Comments to "Martha of Bethany vs. Gobnait"
A careful analyst would say my chance I missed! So lim’ricks I’ll desist — such rhyming I’ll resist! 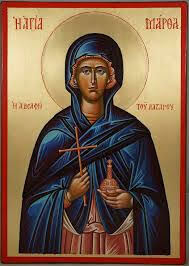 St. Martha poor Photini with her ladle did assail. Next Gobnait’s buzz just barely beat Ignatius in their bout. No more my words I’ll twist: there’s no-one on my list! Now all of them have missed — there’s none left on his list! I’m in the same place, John, there’s no one on my list. I suffered damage from the beginning, with my final choice, Phillips Brooks, going down in the first round. That being said, by sticking around to vote even after I have nothing to gain personally, I am struck by the two beautiful bios written today by Belldene and Hansen. Congrats to both for such moving and personal tributes. I am particularly moved by Amber’s juxtaposition of Martha and Mary and her own personal attempts at the contemplative life. I have only recently discovered that the contemplative life works for me very well indeed, but I have admiration and love for the Marthas of the world, so that is where I will place my vote. May we love each other as we love ourselves! I too was struck by the eloquence of today’s celebrity bloggers. I am suspecting that Martha will win the halo, but I voted for Gobnait, because everyone seems to assume that Jesus is putting Martha down in the gospel story, and I don’t think that is it at all. I think Jesus was speaking to the spirit in which we do things, you can’t assume everyone would have gone hungry if not for poor overworked Martha. Do we hear Martha asking Mary for any help? No. I did appreciate Gobnait’s care for those poor forgotten ironworkers. Yes, I agree with you, Betsy. 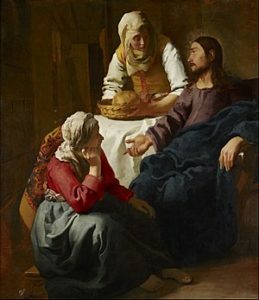 I believe that Jesus recognizes that Martha and Mary are two different types of people, and is encouraging Martha to be more forgiving of her sister, but not criticizing her for not behaving like Mary. Haha! Sounds about like my bracket! Our tribute this morning takes us to the Elizabethan Era and the age of the the Bard, William Shakespeare. To honor Martha a Gobnait, sing along to the tune of “Welcome to the Renaissance” from the musical “Something Rotten”. War of the Romans. A to Z.
Sisters who blister for status. St. Nick v. Rudolph’s Christmas theme. All this was this year’s Lent Madness. Some haikus and lim’ricks and Diana’s hymn. That was so Monday Madness. That was so Scott and Tim. Welcome to the Faithful Four! They serve and fight for justice. They guard their town with swarms of killer bees. Look like a bishop’s search. Narrow views of Martha makes supporters yelp. Her faith was never flaggin’. She also slayed that dragon. Was the theologian of her time. Lit’rally were treated to a hornet’s nest. Drew lines for their protection. Both these saints lived lives that were sublime. Lent Madness bracket saints are heaven sent! When their brackets busted, some people swore. The left side of the bracket today will be done. Who did not make Faithful Four? Let’s look back just for fun! Hey look, it’s that Photini drawing water quite serenely. Well, it seems that Martha martyred her as well. Buh-bye. Hey look, it’s St. Ignatius. Lost as well, but so gracious. Gobnait o’er the Jesuit founder ran pell-mell. And buh-bye. Ananias! Uh-huh! And Tikhon of Zadonsk! Dorcas, too – and our brightest saints! Yo! Here they come, their two stars collide. They’re just so freakin’ awesome! Their lives were so saintly. Our faith they diffused. Martha or Gobnait? Lord, how can I choose? Not the one concerned with the BBall score. Where Anna Alexander came in and cleaned up. Where Anna’s face is on a coffee cup. And it’s time Lent Madness winds down once more. Spy Wednesday is the day when their stories are told. Whose halo’s made of gold? Welcome to the Faithful Four. Spy Wednesday is in two days! Adorable; maybe your best yet. So perfect and it put a smile on my face. Thanks for the holy week wake up! voted for Gobnait today in honor of the iron workers, specifically those who worked at Ground Zero following 9/11. Have been watching several stories the last few days on YouTube about that day that I had never heard before. Stories of love and faith and selfless sacrifice, and surprisingly-no hatred, from those whose lives were intimateky affected. Certainly the trickiest lyrics of any musical ever! I can’t believe you got them all in there. I am so going to miss waking up to these songs… It has been such a treat–both the tunes I knew and the new ones I learned (like today!). Thank you! I have a question–once a saint has been nominated and loses, can he or she ever be nominated again. I have to confess my heart is broken over Damien of Molokai. Golden honey for a golden crown. #VoteGobait. Because this is the essence of being Christlike…my vote is for Gobnait. This is the quote I will long remember from LM2019. She has my vote. Mine too. I also was moved by the write up and the quote. That got me, too. I thought I was going to vote for Martha but ended up with Gobnait. That quote hit me too. Gobnait all the way! Great write up on Gobnait. I was very moved by this. Neck in neck as I submit my vote, not a surprise . Love them both but decided Gobnait this time . Exciting now to see the finals shaping up . This was so hard! I quite literally had to flip a coin because I wanted to vote for both! My coin toss said Martha so I voted for her but will be pleased no matter who wins. Down to the Final Four! In fearsome finality the foursome faces forth to falter not and fend off the finish. Jerry, that’s brilliant! Thanks for the chuckle to start the day here on the west coast. I am thankful for this and all four of these women. How do we vote against one? I am going to silent retreats now and trying to be more contemplative. Yet, i know who am and i voted for Martha. For Celebrity Blogger David Hansen re Gobnait: If it’s time for “ordinary” saints and not “superstars” that’s why I chose Martha over Gobnait. Poor Martha, a model of love, hospitality and caring even if a trifle impatient and what’s her reward? Being told she didn’t choose wisely. Yet she did choose wisely – she welcomed Jesus and his entourage and cared for her family. She is the one who proclaimed him as the Son of God at the grave of her beloved brother. Not a superstar – an extraordinary woman of faith and hope. Martha’s story has more than one episode. She complains to Jesus when she feels Mary has left all the hospitality work to her. Jesus responds. We see Martha later at the feast where Mary is anointing the feet of Jesus and wiping them with her hair. Who complains this time? Not Martha–Judas. Martha has learned. We see Martha again when Lazarus falls ill and dies while the family is waiting for Jesus to come. Martha runs to Jesus with her broken heart and affirms her faith in him– and her brother rises. Martha, like the non-prodigal son, does her duty and speaks bluntly when she feels her faithful work is taken for granted. Instead of feeling confused and nursing resentment, she questions. And she learns. She’s complicated and human. Her journey from kitchen kvetcher to dragon tamer deserves consideration, admiration, and a Golden Halo. Yes, Peg S! It seems like everyone always focuses on the first story we hear of Martha and I’ve always felt like Martha is given a bum rap because of it. I so identify with Martha and without her example of service would we even recognize others’ service. Gobnait seems to have followed Martha’s example. Did anyone other than me reflect on Dismas when his part was read during the Passion yesterday? I preached on Dismas closing out my Lenten series on “second chances.” I was inspired by my fellow Lent Madness crew, so thanks for your help in sermon prep. Peg, a great post that captures my thoughts too. I am drawn to Gobnait, but feel close to Martha’s story of using her gifts, learning, and speaking. Thank you, Peg! I was planning to vote for Martha, partly because I’ve voted for her from the beginning–God loves even us busy-bodies. Your comment encouraged me to remember her continuing faith and action. With bees threatened around the world, I vote for the beekeeper! With the bees endangered by our stupid chemical farming choices I must support her whos simplicity is likewise endangered by our hectic world. Besides I can’t get past Martha condemning her sister’s choice to entertain her guests while Martha preferred to shave in the kitchen. We don’t all follow the same path. I like how Amber tried to preempt the bee imagery and get there first with the bees. Well played. I especially like the personal testimony about accepting one’s vocational gifts. Well said. John 11:27. That went right over my head! Thanks for pointing it out! I noticed that, too. Both pieces were excellent today. I can’t say it any better than Patricia and Peg S., above at 8:39-8:40. Forget the pious accretions to the stories of both saints, and focus on the Gospel accounts of Martha’s fidelity and diligence. So, I’m looking at the final four and seeing how voting went since the beginning. If gambling wasn’t a pathway to seperating ourselves from Christ and others, I would lay money on Pandita. I don’t know, people loved Zenaida too. I think it’s going to be very close. Gobnait extra ordinary acts of love, kindness and service. Why am I so taken with St. Gobnait? Why do I find her so fascinating and inspiring? Perhaps, I am intrigued that she could command bees to protect her village. There were many women who functioned as healers, so why am I hoping she’ll win the Golden Halo? In this particular match-up, it’s a no-brainer for me to vote for Gobnait over Martha of Bethany. I’ve read all the arguments that Martha personifies the ministry of action, of doing good works, but I honestly can’t get past her petulant attack on her sister, Mary, and Jesus’ rebuke. Gobnait was also a woman of action, defending her village and caring for the villagers, using her bees’ honey as a cure. Even today, honey is known for its anti-bacterial and anti-inflammatory properties, as well as soothing a sore throat and calming a cough. It’s used in healing wounds and is especially effective on severe bruising. So, for all the LM folks who are contemplating a vote for Martha because she is a ‘doer,’ please consider St. Gobnait as a ‘doer’ as well. And Gobnait does it with sweetness! My 90 yr old bedbound mother had a bed sore on her heel the hospitalist doctor said would never heal because of poor circulation. Thanks to a great visiting nurse and manuka honey it’s almost gone. That and the great write-up influenced me to vote for Gobnait. Love your thoughts here, though I must say, as a sister myself, I find Martha’s “attack” to be humanizing — maybe I, too, can be a great saint, despite my sibling squabbles! This year’s Lent Madness has been great. Not ready to see it end. We have missed Oliver’s comments this year. Pray he is well. I too have been wondering about him! Gobnait is the perfect saint for the Golden Halo. Lent Madness is all about educating us about saints we never knew. EVERYone knows about Martha of Bethany. No more education needed there. But just look into the future and see Gobnait (or Zenaida, or Pandita Ramabai) pictured on your commuter coffee mug. See people asking “who the heck is that?” See yourself proudly explaining about this unknown saint and why she is so honored that the golden halo is hers! That right there is evangelism. That right there is WHY Lent Madness exists. I think you just helped me decide! Gobnait it is for us! Healing and creation care – what we and our world so very much. I respect Martha, of course – but for today, Gobnait has my heart and my vote. Voting for Vermeer. Love that painting! Beautiful write-ups on both candidates today. Had to vote for Martha, but it was difficult. I wish I could vote for both of these wonderful saints. Thank you to the celebrity bloggers for their moving words. In the end, as someone who is still wrestling with the nature of my vocation, my vote goes to Martha. May I, like her, live with integrity and pursue my own calling. Thank you Amber and David for your thoughtful reflections today. Your words only made a tough choice tougher. The bloggers made this an exceptionally difficult choice. Both testimonies will stay with me. I think I am voting for Gobnait because I won’t forget about Martha, but I may be in danger of forgetting about Gobnait – one of the ordinary saints of God – and I mean to be one too. very hard, indeed. Ironic, that we value Gobnait in part to look past the superstars to the ordinary–yet to vote for her puts her among the superstars. Haven’t decided yet. WOW! This was a difficult choice. We are anxious to find out who wins today’s match-up! So hard to vote today. I went with Martha but was fascinated with Gobnait also. Love Gobnait and my tea with honey, but my soul is a Martha. Martha for the Halo. I do love Martha; truly I do. But, the chastizement story and her goal of a more contemplative exercise of her faith represent for me the ever-present subversion of woman’s purpose in the Bible as an instrument of patriarchal social norms. (What a mouth-full.) Therefore, I choose Gobnait. Check out Elizabeth Cady Stanton’s last suffrage accomplishment, The Women’s Bible. Why do you think Martha’s goal was a more contemplative life? My guess is that she went right back to serving her guests. Thank you for mentioning Elizabeth Cady Stanton’s ‘The Woman’s Bible’. I had never heard of that before. I just downloaded it and am looking forward to reading it. I loved Amber’s reflection about the tension inherent in Martha’s “busyness”, and the criticism that has been heaped on her as a result. As one who has tried vainly to suppress my kinetic side, she has always resonated. As Amber writes, Martha is the “Biblical example of a holy, active life.” Amen. “Kinetic.” Now there’s a word to lift your hat to! I have voted for all four of these women, so at this point it’s eeny-meeny-miney-mo. I’m good with whoever wins. Wow, today’s a toughie! Gobnait and Martha are my favorites out of the whole bunch. I love both these ladies and think both deserve the Halo for different reasons. Alas, there can only be one. So I cast my vote for the quiet, daily disciple. Gobnait for the Golden Halo! Today I recognize the dichotomy of my own being between Martha and Mary and my difficulty in being still for very long. However, I had to give the mostly unrecognized Gobnait my vote. She being relegated to the back of the class deserves to be moved forward in recognition of her offerings. Martha is worthy of the Golden Halo but I just have to say go Gobnait. Beautiful and inspiring reflections by both Amber and David today. They made a hard choice even more impossible, which is actually a good thing. To all you Marthas, who seem to feel guilty that you aren’t Marys, here’s one Mary who has always felt that though they never said so outloud, the Marthas in my life all were criticizing my ‘Mary-ness’ as they bustled. Maybe it’s just my own guilt…today, though I do appreciate Martha, particularly for her declaration at Lazarus’s tomb that Jesus is the Christ, I’m going to support the lesser-known one, whose gold halo (if she gets it) may bring her more attention. Besides, my brother-in-law just got a couple new hives of bees to replace those he lost this past winter. From another Martha, I have to agree with Martha Kahn. Ditto! I’m with you Martha’s!! YUP, said the same thing! I am another ‘ordinary saint’ I only care what God thinks. I don’t need the recognition at meetings or in the bulletin. If I do more than 10% of my time tithe – oh well. Our heavenly Father knows and that is what matters. I voted for Martha. Retirement has deprived me of the satisfaction of good work well done. Yet before, when I was so busy, I yearned for more time for prayer and contemplation. How could I overlook the fact that now I have one of my heart’s desires? Martha accomplished much and was able to serve Our Lord with her own gifts. I can’t remember if I shared this image of Gobnait before, but I like it! Oh dear—sorry for that epic link! Techno-people, how could I have shortened that?! I think you can put it into “tiny url” for a shorter link. I follow the Abbey of the Arts, with its “Holy Disorder of Dancing Monks”. It feeds both my spirituality and my creativity. That image is part of a series commissioned by the founder, Christine Vaulters Paintner. I believe she lives in Ireland now and much of what she writes is steeped in Celtic tradition. Thank you, David and Amber! Both of your summaries resonated with me: ‘busy worker bees building up the kingdom’ (in the Martha summary) made me chuckle out loud in its juxtaposition with Gobniat and ‘unnamed folks far from the spotlight’ (in defense of Gobnait) reminded me of the blessings from all those ‘saints’ I have be privileged to be ‘busy’ with on this earthly journey. Both these ladies lived lives of service to others. . .as should we all in whatever capacity we have to serve. So, in deference to the lack of difference between the two, I flip the coin! Either is a worthy candidate! I’ve never liked that the story of Mary and Martha gets read as Mary vs. Martha (contempletive vs. active) when I read it as about pursuing one’s calling (or spiritual gifts) to love Jesus within the roles we are in, whether that be mistress of the house (Martha) or not (Mary), and doing that in a way that focuses on Jesus and not distractions or cultural expectations (like of hosting in a certain way). I don’t think we need to look past the Biblical story to later tradition to get that. We just need to look past the ongoing centuries of misreading the story. That’s just Luke’s version anyway. It’s John’s Martha who really shines. In John 12’s version of this story, just before Jesus’ entry to Jerusalem (Palm Sunday), Martha serves at a dinner for Jesus in someone else’s house. Judas is the one who gets corrected for scolding Mary for sitting at Jesus’ feet (and anointing them). In this story, Martha’s service exemplifies what Jesus then suggests we should be doing now that he is no longer with us in the same way: serving others (the poor) in his name and in his stead. Also, although the woman at the well (Photini) in John 4 is the first to have faith in Jesus as Messiah, Martha in John 11 also expresses this same faith but she is also the very first to have faith in Jesus’ resurrection, a far more radical belief at the time. I’m surprised this hasn’t been mentioned more. To me, that’s the biggest reason Martha deserves the Golden Halo. Martha is a favorite because she reminds us of ourselves. Jesus got it wrong – we’re fine just the way we are. Vote for yourself! Vote for Martha! I was very moved by these bios today. I thought I would vote for Martha, as I haven’t seen Gobnait’s story as being compelling. However, today the compelling point of the unsung faithful touched me deeply, and resonates with the need to keep on keeping on even when unrecognized. The meaning and impact of Gobnait’s life of service spoke to me and I voted for her joyfully and with conviction. This was a most difficult chose today. Being a “Martha” myself, I found today’s bio of Martha very comforting. Perhaps now I can find comfort knowing that it is because I’ve been gifted as a Martha that I find it difficult to be quiet in prayer and meditation. But, being beekeeper, I am biased towards Gobnait. Oh, decisions! Martha gets my vote! Sorry Gobnait. (hope my bees don’t find out! Amber and David both did such a fantastic job today that they made an already difficult decision even harder. I finally voted for Gobnait, thinking of so many people I have known, many of them women, who were faithful disciples doing so much good in quiet ways. “Let us now praise famous men.” Let us now praise women who are not famous and are deserving of our admiration. We have come, in our times, to worship the superstars. Yet, it is the quiet, the unknown, the toilers who make life possible for the rest of us. Gobnait speaks to me as someone who does not reach superstar status but is an illustration of the meek of the Sermon on the Mount. Martha absolutely, from an Altar Guild member. Irish bee whisper to the Golden Halo! Gotta go with Martha, the worker bee. God’s kingdom needs worker bees. Come in all ye beekeepers, honey-lovers, iron workers and Celts. Let’s put our sweet Gobnait, the unknown, over the top. I’m Team Martha for the duration now. Her witness in the gospels continues to draw me deeper into comtemplating Christ. Furthermore, each of the remaining ladies has defeated a favorite of mine somewhere along the way, and although Martha bested Photini, I’d like to see a Biblical winner crowned for the first time since 2012. A drastic cure, but I take your point. While I am grateful to learn about Martha’s second act, I cannot vote for her. It is precisely because of ‘the hectic pace of modern life’ where so often our value is tied to what we do and how busy we are that I need to look to someone else. Gobnait, defender of community and carer of creation, would make an inspiring standard-bearer. Gobnait is my youth group’s favorite!! They are all hoping she’ll win the Golden Halo! Martha may have been miffed that Mary wouldn’t help her when they had guests… but it was Martha who, in the midst of her grief over her brother’s death, proclaimed Jesus as the Son of God. 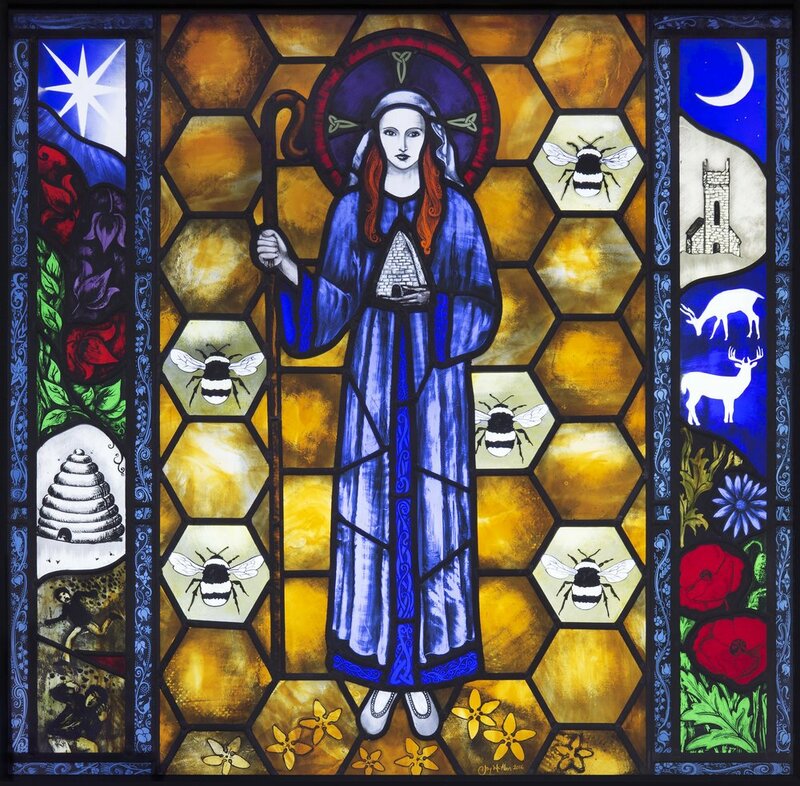 While I may never see another bee without thinking of Gobnait, I voted for Martha. I met defeat on the very first day as I rooted for Mary, and I expected James to best Gobnait for the Golden Halo. And I am a member of the Holy Disorder of Dancing Monks, and have the set of prayer cards which I displayed in no particular order, but found the first one was Gobnait. Gobnait! 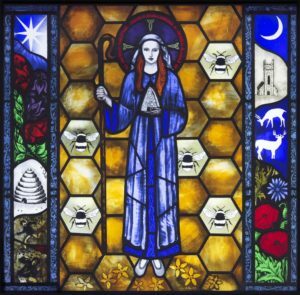 Bees/care of creation, using honey as a cure, defending her village with bees, patron saint of iron workers. I’m a Mary. And we need Marthas, otherwise nothing would ever get done! We need the Altar Guild in order to worship, and helping those in need also requires work! Sitting around reading and thinking, although it may be my natural inclination, doesn’t really help anyone. Prayer is important, of course, but should be combined with action. I’ll not only vote for Martha, but continue to try to be more like her. Aside from the fact I like bees and her stories, I had to vote for Gobnait. That poor woman, can you imagine having Gobnait for a name? I couldn’t NOT vote for her. Never could even believe that people would vote for Martha over Mary, but people are funny. Gobnait certainly displayed virtues however. Let’s hope that pesky Martha is finally shown the door. Mary wasn’t on the bracket this year. I’m pretty sure you can’t show Martha the door; she’s the hostess. It’s you who has to leave. Once again I wish there were an “edit” button. Mary WAS on the bracket. The etymologies are correct, however. Those came from the OED. I was going to vote for Martha until I read the last sentence on Gobnait. More everyday, unknown saints, doing the right thing. Wow, only 15 votes apart at 7 p.m. Eastern time! A real white-knuckle finish today. Where have all these votes for Gobnait suddenly come from? Are bees voting? It’s somehow suspicious. It’s beewildering. It could bee some rogue IB address. One bee, one vote. SMDH. Martha was active in the church in Cyprus (by the way, the place Cyprus is spelled with a U, Cypress is a tree or a place in California, which I am sure was not the abode of this particular Martha) which has a special place in my heart. However I am a nurse in a country with universal health care and Gobnait speaks to me and my ministry, so Gobnait it is! I am touched by the beautiful write ups for both these Holy women, Thank you! Shame on the multiple voters. Wow!! This is one very tight match up. Since my bracket blew up on the first day, I’ve just been enjoying getting to know all these saints a little better. Thank you, bloggers! Again, did not vote, as these two magnificent and holy women have both made such an impression on me that it is impossible to make such a decision. That’s mainly because of the two articles which introduced them to me. Thanks again. Amber Belldene – Thank you so much for sharing part of your spiritual journey with us in today’s blog for Martha (she’s been my pick all along this strand). Beautifully written. I’m working on a Christian formation class for our church in West Seattle on identifying our spiritual gifts and discerning the call to use them. If you don’t mind, I’m going to share this with the group. A great commentary on accepting that which we have been given. What have we come to when you have to cheat to win a Lenten bracket? I can only say, that as a first time Lenten Madness participant, this kind of behavior will not overshadow my Lenten devotion, prayers and fun due to the amazing work of the SEC, celebrity bloggers and the devoted/creative Lent Madness viewing public. Indeed, what have we come to when we are cheating on Lent Madness votes? I am tempted to answer: the age of a particular national figure, but I don’t want to stoop even lower to politicize our holy devotion. I do, however, demand a recount of Gobnait vs Ignatius of Loyola!! would be fun. A question for the cheaters to ponder while they bask in purple darkness though- how did that work out for you? Why not just be honest like the rest of us? And wouldn’t it also just be easier to vote just once instead of spending aaall that time padding the ballot box and figuring out ways to not get caught, etc and maybe even having anxiety attacks over whether you will or not??? Why not just leave it to God and the SEC after you vote once then be supportive either way when the results come out! Oh no, I forgot to check the boxes on notifiers underneath my previous post but yes, I would like those as usual. Also, this set me to wondering I there might be a hacker running around somewhere. A couple of days ago I found the usual Lent Madness email opened for me and the Scott at my house-Scott S. doesn’t care for Lent Madness. There are only myself and he living there, we’re the only ones with access and he tends to leave things Lent Madness sends alone as well. Couldn’t also be the cats or the Pomeranian at my house either lol- especially as when I got her the former owner had named her “Faith” and she’s a good little Episcopal dog who doesn’t believe in doing those types of things if she were able, lol! This is so exciting! Can’t wait to see who wins!! But so sad that another year of Lent Madness is almost over.